With an integrated counterweight and tight tail swing radius, a swing boom that hugs the machine, and operating weights ranging from 8,000 to 8,240kg, the PC80MR‐5 has been designed for working in confined areas and urban environments. Komatsu’s reliable and tough design solutions have further reduced machine downtime. The auto decelerator and idle shutdown now both come as standard, helping to reduce fuel consumption, increase residual value and lower service costs. The proportional lines improve the machine’s productivity and versatility when working with attachments. Newly developed hydraulic electronic controls optimise machine performance, and also lower fuel consumption, whatever the job. The six selectable working modes, a concept usually reserved for higher end hydraulic excavators, deliver relaxed operations and increased profits. A control lever neutral detection system provides what is said to be an industry leading safety feature, along with the engine shutdown secondary switch and seat belt caution indicator. The easy to use tie down brackets provides fast and easy transportability. 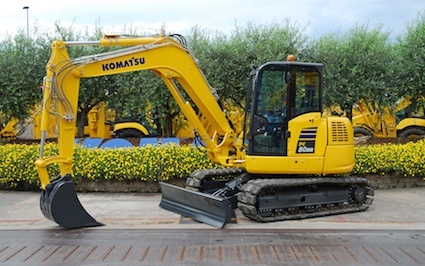 Komatsu Italia Manufacturing, located in Este, Italy, is a subsidiary of Komatsu Ltd., and specialises in the manufacturing of mini excavators, skid steer loaders, backhoe loaders and hydraulic excavators under 17t. The new PC80MR‐5 is but the latest excavator to be designed and built in Italy.